A new World Trade Organisation (WTO) report has said that China will outperform other economies in 2013 even as it painted a grim economic portrait for the global economy. 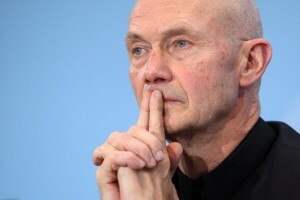 “China’s growth should continue to outpace other leading economies,” said WTO director general, Pascal Lamy. It also said that China’s growth should cushion the global slowdown, but exports will still be constrained by weak demand in Europe. “As a result, 2013 looks to be a near repeat of 2012, with both trade and output expanding slowly, below their long-term average rates,’’ the statement said. According to the WTO, crippling growth in developed economies has led to the decline of world trade in 2012, coupled with the troubling prospects for the Euro. It said world trade growth fell to 2.0 per cent in 2012 – down from 5.2 per cent in 2011. Trade growth is expected to remain sluggish in 2013 at around 3.3 per cent as the economic slowdown in Europe continues to suppress global import demand. “The events of 2012 should serve as a reminder that the structural flaws in economies that were revealed by the economic crisis have not been fully addressed, despite important progress in some areas. Repairing these fissures needs to be the priority for 2013,’’ said Lamy, quoting WTO economists. Flagging output and high unemployment in developed countries reduced imports and fed through to a lower pace of export growth in both developed and developing economies. Lamy has warned that as long as global economic weakness persists, protectionist pressure will build and could eventually become overwhelming. “To prevent a self-destructive lapse into economic nationalism, countries need to refocus their attention on reinforcing the multilateral trading system. “Trade can once again be an engine of growth and a source of strength for the global economy rather than a barometer of instability. The way is before us, we only need to find the will,’’ Lamy said in a statement issued by WTO secretariat on Wednesday.